The BIG BEAD SHOW was held at Sandown Park , Surrey, on the 1st December. It was very well attended and well worth the visit. I bought items from PURPLE MOON BEADS, THE BEAD SHOP, THE SPELLBOUND BEAD CO. JULES GEMS, G.J.BEADS and several others. 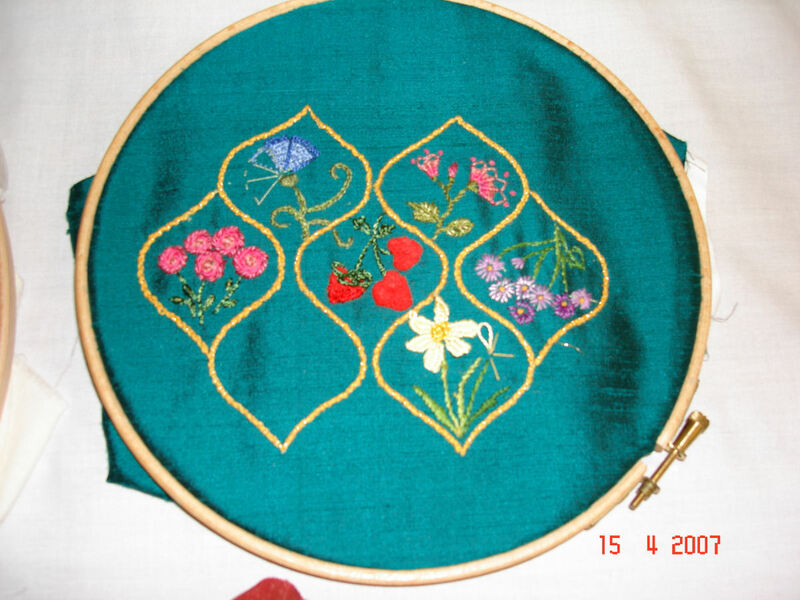 EAST KENT EMBROIDERERS GUlLD, residential Weekend Course is held every year at Withersdane College Wye, Kent, the weekend after Easter each year. In 2007, I joined a group tutored by Pam Buck, entitled "Over the Top". 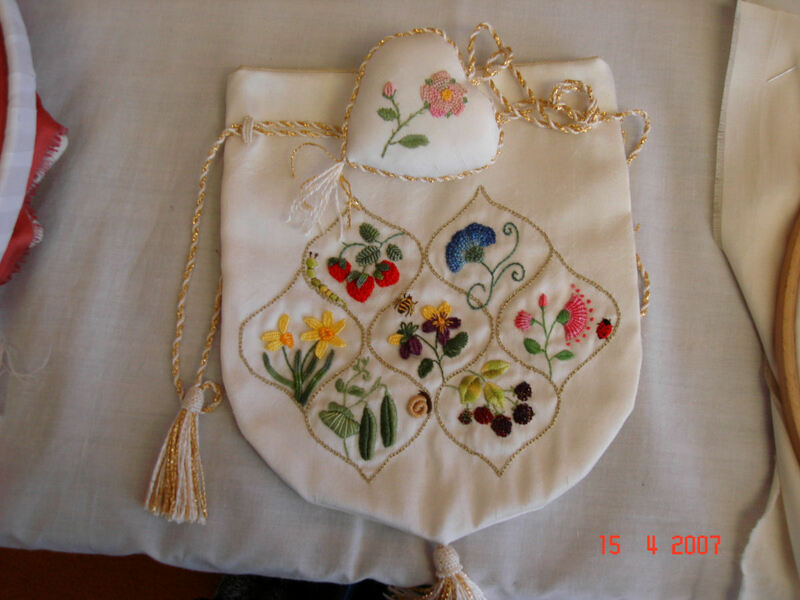 We worked with Elizabethan embriodery making Sweetie Bags, used by ladies in the court of Elizabeth I.
I embroidered on slub silk material with number 8 perles, variegated cottons and silk threads. These photos show some of the work produced. The tutor brought along some examples of sweetie bags and small boxes that she had made. Some of these are included in the photos. Due to time restrictions the student's items are shown unfinished. Photos of the finished work will appear later. Exhibition of our Thursday group's work at the Horsebridge Centre in Whitstable, Kent. (Autumn 06). On Thursday afternoons, I meet with several friends to stich and put the world to rights. Helen, who has achieved City & Guilds Diploma for textiles, and is very talented, suggested that we put on an exhibition in a local gallery. We decided to call it "Christmas in Stitches". 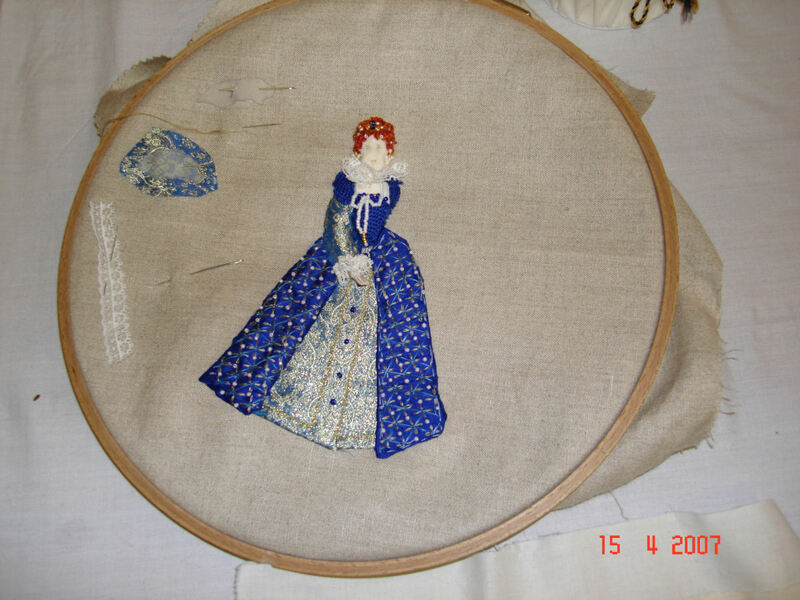 Helen, Kathy and I exhibited some of our embroideries and took turns to steward and be on hand to answer questions. Some items were for sale. There are photos in the panel on the right. 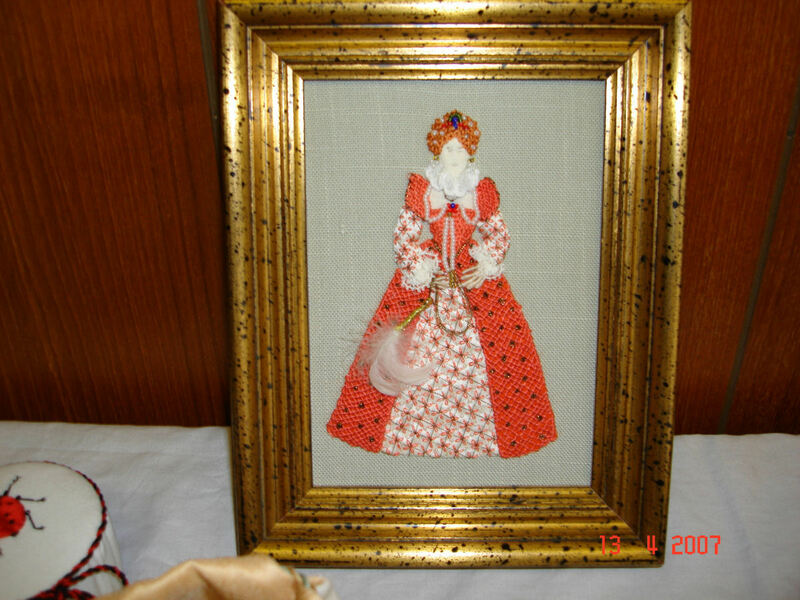 Kathy's and Helen's grand children displayed some pieces they had made. Their ages ranged from 5 to 9 years. Many of the pieces are abstract using colour and form to represent winter and Christmas. I displayed my Winter Scene, serveral tatted pieces, some cross stitch pictures and my knitted snowman.